The status of the Green River as a tributary of the Colorado River came about for mainly political reasons. 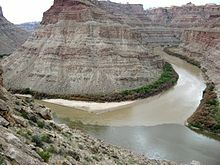 In earlier nomenclature, the Colorado River began at its confluence with the Green River. Above the confluence the Colorado was called the Grand River. In 1921, Colorado U.S. Representative Edward T. Taylor petitioned the Congressional Committee on Interstate and Foreign Commerce to rename the Grand River as the Colorado River. 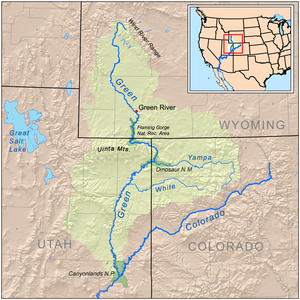 On July 25, 1921, the name change was made official in House Joint Resolution 460 of the 66th Congress, over the objections of representatives from Wyoming and Utah and the United States Geological Survey which noted that the drainage basin of the Green River was more extensive than that of the Grand River,  although the Grand carried a higher volume of water at its confluence with the Green. It rises in western Wyoming, in northern Sublette County, on the western side of the Continental Divide in the Bridger-Teton National Forest in the Wind River Range. It flows south through Sublette County and western Wyoming in an area known as the Upper Green River Valley, then southwest and is joined by the Big Sandy River in western Sweetwater County. At the town of La Barge, it flows into Fontenelle Reservoir, formed by Fontenelle Dam. Below there, it flows through open sage covered rolling prairie where it is crossed by the Oregon, California and Mormon emigration trails and then further south until it flows past the town of Green River and into the Flaming Gorge Reservoir in Southwestern Wyoming, formed by the Flaming Gorge Dam in northeastern Utah. Prior to the creation of the reservoir, the Blacks Fork joined the Green River south of Green River, today the mouth of Blacks Fork is submerged by the reservoir. South of the dam it flows eastward, looping around the eastern tip of the Uinta Mountains going from Utah into northwestern Colorado and through Browns Park before turning west and then south into Dinosaur National Monument where it passes through the Canyon of the Lodore (Otherwise known as the Gates of Lodore) and is joined by the Yampa River at Steamboat Rock. It turns westward back into Utah along the southern edge of the Uintas in Whirlpool Canyon. In Utah it meanders southwest across the Yampa Plateau and through the Uintah and Ouray Indian Reservation and the Ouray National Wildlife Refuge. Two miles south of Ouray, Utah, it is joined by Duchesne River, and three miles (5 km) downstream by the White River. Ten miles farther downstream it is joined by the Willow River. South of the plateau, it is joined by Nine Mile Creek, then enters the Roan Cliffs where it flows south through the back-to-back Desolation and Gray canyons, with a combined length of 120 mi (192 km). In Gray Canyon, it is joined by the Price River. South of the canyon it passes the town of Green River, Utah and is joined by the San Rafael River in southern Emery County. In eastern Wayne County it meanders through Canyonlands National Park where it joins the Colorado. The Flaming Gorge Dam in Utah is a significant regional source of water for irrigation and mining, as well as for hydroelectric power. Begun in the 1950s and finished in 1963, it was highly controversial and opposed by conservationists. Originally, a dam was to be built in Whirlpool Canyon, but the conservationist movement traded the Flaming Gorge dam for halting that proposal. Apocryphally, the Sierra Club, a not-for-profit environmental organization, lost its tax-exempt status for political action in opposing the proposed dam. The Green is a large, deep, powerful river. It ranges from 100 to 300 feet (30 to 100 m) wide in the upper course to 300 to 1,500 feet (460 m) wide in its lower course and ranges from 3 to 50 feet (1 to 15 m) in depth. It is navigable by small craft throughout its course and by large motorboats upstream to Flaming Gorge Dam. Near the areas where the Oregon Trail crosses, the river is 400 - 500 feet (150 m) wide and averages about 20 feet (6.1 m) deep at normal flow. Green River, Wyoming, by Thomas Moran, 1878. Green River and Upheaval Dome, Canyonlands National Park. Archaeological evidence indicates that the tributary canyons and sheltered areas in the river valley were home to the Fremont Culture, which flourished from the 7th century to the 13th century. The Fremont were a semi-nomadic people who lived in pithouses and are best known for the rock art on canyon walls and in sheltered overhangs. In later centuries, the river basin was home to the Shoshone and Ute peoples, both nomadic hunters. The Shoshone inhabited the river valley north of the Uinta Mountains, whereas the Utes lived to the south. The current reservation of the Utes is in the Uintah Basin. The Shoshone called the river the Seeds-kee-dee-Agie, meaning "Prairie Hen River." While it was known that the Green River drained to the Colorado, the exact course was not known. Miera's map showed the Colorado River branching into two major streams – the Nabajoo (San Juan) and the Zaguananas. It also showed the Zaguananas branching into four heads, including the Dolores and the Rafael (the latter of which Escalante's journal equates with the Colorado per information from the Native Americans). A map of 1847 redirects the course of the Rafael to the north and labels it as Green River. It would be some time before the true confluence of the Green and Colorado Rivers would be known. The Old Spanish Trail from New Mexico to California crossed the river just above the present-day town of Green River, Utah. The Green River emerges from the Tavaputs Plateau. In the early 19th century, the upper river in Wyoming was part of the disputed Oregon Country. It was explored by trappers from the North West Company and Hudson's Bay Company, such as Donald Mackenzie who pioneered the area, from 1819. In 1825, the American William Ashley and a party of American explorers floated down the river from north of the Uintah Mountains to the mouth of the White River. The valley of the river became increasingly used as a wintering ground for American trappers in the next decades, with trading posts established at the mouth of the White near Whiterocks, Utah, and Browns Park. The Upper Green River Rendezvous Site near Pinedale, Wyoming was a popular location for annual mountain man rendezvous during the 1820s and 1830s, with as many as 450 to 500 trappers attending during its heyday in the 1830s. Bowknot Bend on the Green River, north of Canyonlands. Named by John Wesley Powell in 1869 (see quote in text). From the 1840s through the 1860s hundreds of thousands of emigrants made their way west along the Oregon, California and Mormon emigration trails. Nearly all of the primary emigration routes had to cross the Green River at some point. The main trail crossed near where the Big Sandy River joins the Green River in Wyoming. The river is too big and much too deep to ford at any time of the year, and is the largest, most dangerous river crossed by the Oregon Trail. For that reason, ferries were commonly run on this stretch of the river. Some of the popular ferries included the Lombard and Robinson ferries at the main crossing, and the Mormon, Mountain Man, and Names Hill ferries where the popular Sublette-Greenwood cutoff crossed the river further upstream. In 1878 the first permanent settlement in the river valley was founded at Vernal by a party of Mormons led by Jeremiah Hatch. The settlement survived a diphtheria epidemic its first winter, as well as a panic caused by the Meeker Massacre in Colorado. Most of the land in the valley of the river today is owned and controlled by the federal government. Private holdings are largely limited to bottoms. Until the 1940s, the economy of the valley was based largely on ranching. Tourism has emerged as the dominant industry in the region in the last several decades. A proposed nuclear power plant, the Blue Castle Project, is set to begin construction near Green River in 2023. The plant will use 53,500 acre feet (66,000,000 m3) of water annually from the Green River once both reactors are commissioned. The Green River Basin contains the world's largest known deposit of trona ore near Green River, Wyoming. Soda ash mining from trona veins 900 and 1600 feet (300 and 500 m) deep is a major industrial activity in the area, employing over 2000 persons at four mines. The mining operation is less expensive for production of soda ash in the United States than the synthetic Solvay process, which predominates in the rest of the world. The area has been mined for uranium. ^ a b c Michael Enright; D.E. Wilberg; J.R. Tibbetts (April 2005). "Water Resources Data, Utah, Water Year 2004". U.S. Geological Survey: 120. Retrieved 2008-01-20. ^ Many years ago, the Colorado River was just Grand, retrieved January 5, 2008. ^ "Seeds-Kee-Dee-Agie - Wyoming Historical Markers on Waymarking.com". www.waymarking.com. Retrieved 27 January 2018. ^ "Mapa de los Estados Unidos de Méjico : segun lo organizado y definido por las varias actas del congreso de dicha républica y construido por las mejores autoridades". Retrieved 27 January 2018. ^ McDonald, Robert (1976). Braunstein, Jules (ed.). Big Piney-La Barge Producing Complex, Subtlette and Lincoln Counties, Wyoming, in North American Oil and Gas Fields. Tulsa: The American Association of Petroleum Geologists. pp. 91–120. ISBN 0891813004. ^ Law, Matt. "Aeolin Deposits". The Wiki Archeological Information Resource. ^ Eastney (2004). "Geoarcheology: Using Earth Sciences to Understand the Archeological Record". English Heritage Center for Archeology. ^ "Greenhouse Gas Emissions". EPA United States Environmental Protection Agency. Retrieved February 11, 2013. ^ Sutliff Johansson, Stacy. "Ashley Field Petroleum". Prezi. Retrieved December 5, 2012. ^ Nelder, Chris. "The Last Sip". Smart Planet. Retrieved April 2, 2012. ^ Cleveland and O'Connor. "Energy Return on Investment of Oil Shale". Sustainability. Department of Geography & Environment, Boston University, Boston, MA. Retrieved November 22, 2011. 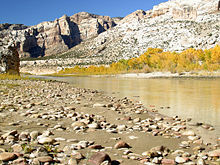 Wikimedia Commons has media related to Green River (Colorado River). 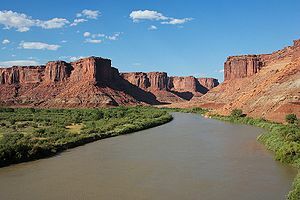 Wikisource has the text of an 1879 American Cyclopædia article about Green River (Colorado River).